In mid-October, after working non-stop for days, in the wake of the Las Vegas shooting, master’s degree participant Dori Koren had a tough decision to make: head to Africa on a planned trek to teach counterterrorism courses or stay with his sisters and brothers in blue. He considers his decision to proceed as a valuable counter-terrorism lesson in and of itself. So Koren, as scheduled, flew to Ghana to work in a State Department Bureau of International Narcotics and Law Enforcement Affairs (INL) educational program teaching counter-terrorism to law enforcement from disparate nations – Mali and Ghana in the western Sahel area of the continent, Nigeria in the central area along with the eastern nation of Ethiopia and the southern country of Botswana. 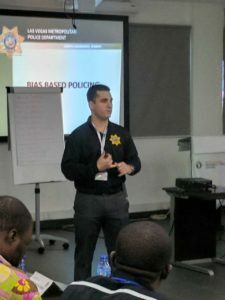 The training took place at a State Department regional training center with about 35 students of ranks and agencies from patrol officers and intelligence agency directors to tribal village chiefs. While the nation’s security challenges differ from each other and that of their peers in the U.S., there is one constant threat law enforcement professionals often voice: money. His goal was not teaching what applies in western society but to understand the differences and figure out common principles to preventing violence. The nations face threats from different groups. In West Africa, the group Boko Haram has wreaked havoc while in places like Ethiopia there are concerns about the group al-Shabab in neighboring Somalia. Many African nations are also concerned Islamic State fighters returning home from Syria. Koren can draw on lessons learned from more than a decade specializing in counterterrorism and intelligence for the Las Vegas Metropolitan Police Department. Currently, he manages the Technical Operations Section which is a component of the Southern Nevada Counter Terrorism Center. He is also working with the Major Cities Police Chiefs Association on a report about virtual intelligence and also traveled to India in 2016 to teach as part of a State Department program. In addition to his practitioner experience he uses his CHDS education to instruct other homeland security professionals. The Social Identity Theory discussed in the Unconventional Threats to Homeland Security course is helpful for teaching counterterrorism as well has helping him better understand the students in his classroom. Much like CHDS, instructors can learn just as much from students who are experts in their fields.